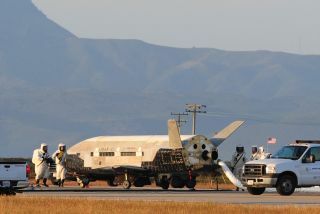 The Air Force's X-37B robotic space plane sits on the runway after landing at California's Vandenberg Air Force Base on June 16, 2012. The vehicle spent more than 15 months circling Earth on a mystery mission. Any celebrations China's space officials kicked off after launching the nation's first female astronaut this month may have been dampened a few hours later by the news that another spacecraft — an American military space plane — had returned to Earth a world away. Just hours after China's Shenzhou 9 capsule roared into space on June 16 with three astronauts aboard, including the nation's first female spaceflyer Liu Yang — the U.S. Air Force's robotic X-37B space plane touched down in California after 15 months orbiting Earth on a hush-hush mission. The Air Force insists the X-37B is just testing out technologies for future satellites, but China has a deep suspicion of the vehicle and its activities, experts say. The X-37B looks like NASA's now-retired space shuttle, only much smaller. The vehicle measures just 29 feet (8.8 meters) long and 15 feet (4.5 m) wide, with a payload bay about the size of a pickup truck bed. For comparison, two entire X-37Bs could fit inside the payload bay of a space shuttle. The X-37B, also known as Orbital Test Vehicle-2 (OTV-2), launched on March 5, 2011, from Florida's Cape Canaveral Air Force Station. Its flight was the second-ever space mission for the X-37B program; the first was flown by OTV-2's sister ship, OTV-1. OTV-1 stayed aloft for 225 days in 2010, well under the supposed 270-day orbital limit for the space plane. But OTV-2 smashed that limit, zipping around our planet for 469 days. The X-37B's payloads and mission details are classified, so it's unclear exactly what OTV-2 was doing up there for so long. But Weeden thinks the Air Force's claim about technology-testing is broadly accurate. Based on OTV-2's orbit — which is also classified but was figured out by keen-eyed amateur astronomers — Weeden reckons the space plane may have been staring down at Afghanistan and the Middle East with some brand-new spy gear, perhaps sensors that can see in wavelengths beyond the visible spectrum. But China seems dubious of the Air Force's explanation, suspecting that X-37B missions might have a more aggressive intent. "Industry analysts said the spacecraft could be a precursor to an orbiting weapon, capable of dropping bombs or disabling enemy satellites as it circles the globe," China's state-run Xinhua news agency wrote on June 17, a day after OTV-2 touched down at Vandenberg Air Force Base. China views the X-37B "as a perfect example of the U.S. developing a space weapon program while stating in public that they're doing no such thing," Weeden told SPACE.com. China is an emerging space power, a country that's ramping up its spaceflight activities and capabilities. The Shenzhou 9 capsule, for example, linked up with the unmanned Tiangong 1 module on June 18 and again on June 24, making China just the third country — after the United States and Russia — to pull off a manned space docking. Shenzhou 9's mission, which is expected to wrap up by June 29, is viewed as a key step in China's plan to build a permanently staffed space station in Earth orbit by 2020. The country hopes to land a taikonaut on the moon sometime after that, and it's also developing its own satellite-navigation system so as not to be dependent on the U.S.-military-run GPS network. China's suspicions about the X-37B may not make American officials too happy, for they've stated a desire to engage the Chinese more fully on space issues going forward. "The U.S. says they're very interested in military-military dialogue with China on space activities, and further cooperation with China in a few different areas," Weeden said.